Enjoy a unique experience with a quantum shift in design, luxury, driving pleasure and innovative technology. From €419 per month*. Wherever you go in the new Lexus ES, it’s reassuring to know that you’re driving the safest premium saloon ever tested by Euro NCAP, with a prestigious 5-star rating. All models are equipped with the very latest Lexus Safety System + comprising advanced technologies that help prevent three of the most common accident types: rear-end collisions, lane departures and collisions involving pedestrians. This is first Lexus to feature ‘Mark Levinson® PurePlay’, an audio technology that envelops the listener. The 17-speaker Premium Surround Sound system comes with a 265 mm subwoofer and Clari-Fi™ Music Restoration Technology that creates peerless concert hall sounds. S-Flow intelligently controls the interior climate according to ambient conditions, ensuring excellent comfort and fuel economy. Perfectly positioned for a relaxing drive, Lexus Premium Navigation is provided via a large 12.3-inch wide display. With vivid 3D graphics and many mapping options. the display can be operated by voice command or the new Touch Pad. A split-screen capability allows you to access multiple information sources. Using technology first developed for jet fighter aircraft, the high-resolution colour Head-Up Display is positioned unobtrusively in your field of vision and projects key information onto the windscreen. The image is so crisp and sharp you’ll easily view data, even in the brightest sunlight. The three-spoke, hand-stitched leather steering offers a snug and comfortable fit and is available with heating for colder mornings. Controls mounted on the steering column mean gear shifts are sporty and integrated switches control everything from audio and telephone to Dynamic Radar Cruise Control. The perforated leather steering wheel is available with the ES 350 F SPORT. A wireless charger inside the console box enables a portable device or smartphone to power up simply by placing it on the charging pad, eliminating the need to connect a cable. The central display screen is controlled by Touch Pad or voice commands. The touch pad interface has been designed to give you the intuitive feel of a smartphone, using operations such as double tapping and flicking. Seat heaters are available for the driver and front passenger. On hot days, cold air is taken directly from the air conditioner, helping to cool the occupants quickly. Up to 16-way seat adjustment mechanisms (up to 14-way for front seat passengers) offer ultimate comfort on long journeys. Drive Mode Select is concentrated around the steering wheel so it can be operated without changing driving position. You decide how you want to drive with a choice of Eco, Normal and Sport modes. The ES350 F Sport also comes with Sport S and Sport S+ options to enhance your experience on long, clear roads. Enjoy ambient lighting and the choice of the wood that’s right for you – Bamboo, Brown Shimamoku or Grey Shimamoku. The aluminium ‘Hadori’ trim is exclusive to the new ES 350 F SPORT and is inspired by the traditional forging process of a Japanese sword, creating a stunning 3D effect. The cockpit features Optitron instrumentation with a central 7-inch TFT (Thin Film Transistor) LCD (Liquid Crystal Display) and an innovative 8-inch TFT LCD on the ES 350 F Sport model. This provides a range of data with exceptional clarity, as well as elegant animations when you enter and start up the car. In addition to door mirrors, radar devices mounted in the rear bumper detect vehicles in adjacent lanes. If you’re indicating to change lane and a vehicle enters the blind spot, a warning signal appears in the relevant door mirror. A control panel is provided on the rear centre armrest that allows passengers to operate the air conditioner, audio, rear seat heater, rear seat reclining, and sunshade functions. To enhance comfort in hot weather, a powered rear and side sunshade is available. Passengers can alter the shades using a control panel on the rear centre armrest. Noise-reducing wheels come with a hyper-chrome metallic coating. The wheel size is emphasised by five dynamic multi-spindle spokes. The ES has excellent aerodynamics, including a near flush under body, which not only contributes to good fuel economy but also reduces wind noise and turbulence. Every trip you take will be a highly rewarding experience, even at higher speeds. A panoramic glass sunroof adds a feeling of freedom, spaciousness and light to the ES cabin. There is also an opening glass section at the front to let in fresh air. Rain sensing windscreen wipers provide a clear view in all weathers. If it is raining when a front seat passenger is getting in or out, the wipers automatically stop and retract to avoid spraying your guest. 3-LED multi-weather headlamps with sequential turn indicators give you exceptional light distribution even in foggy conditions. A two-stage adaptive high beam system cleverly adapts to oncoming vehicles so you avoid dazzling whilst enjoy full visibility. The headlights use the same light source for both high and low beam and come with distinctive Lexus-signature L-shaped Daytime Running Lights. 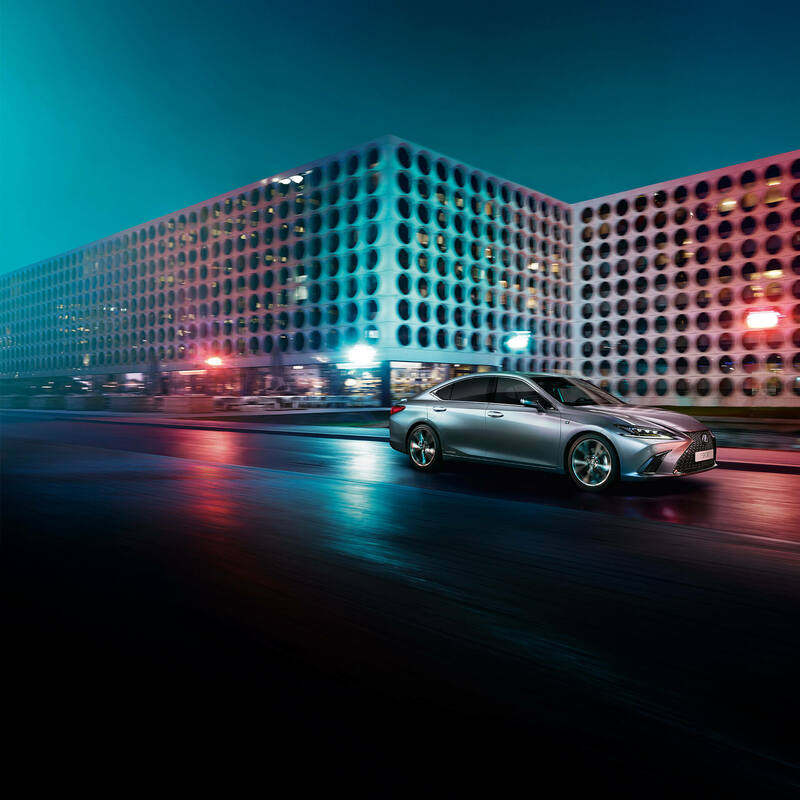 This new generation Lexus features a sleek roofline that emphasises the vehicle’s lower stance and smooth aerodynamics. Using the latest LED technology, the rear lights give your car an instantly recognisable visual signature with crystal-like linear illumination. The new ES is available with the very latest Lexus Safety System +. This includes a Pre-Collision System with day and night pedestrian detection and bicycle day pedestrian detection. Lane Tracing Assist helps you stay on course and a two-stage Adaptive High Beam for enhances night vision. Dynamic Radar Cruise Control with integrated Road Sign Assist recognises traffic signs. For convenient loading and unloading the ES is available with a hands-free power boot lid. This can be opened and closed by moving your foot in front of a sensor underneath the rear bumper while you carry the smart key. Lexus ES 300h. On the Road Price† €50,550. Deposit/ Part Exchange €18,198. Finance Amount €32,352. 36 monthly payments of €418.60. Term 37 months. GMFV †† (Optional Final Payment) €20,274. Total Cost of Credit €3,118.58 (including documentation fee and purchase fee of €63.49 each) Fixed APR 3.9%*. † On the Road Price quoted in finance examples above includes retailer & related charges. ††GMFV payable if you renew or retain the vehicle at the end of the agreement. Further charges may apply subject to kilometre limits / condition of vehicle. *Lending criteria, terms and conditions apply. Finance by way of PCP agreement provided by Lexus Financial Services Ireland DAC. Minimum deposit of 7% and maximum term of 37 months applies. Rate quoted is correct as at 14.11.2018 and is subject to change. This offer is available on all new ES 300h models registered/purchased from 1st November 2018 to 31st March 2019.